A small portion of the Tri-S client wall of fame. 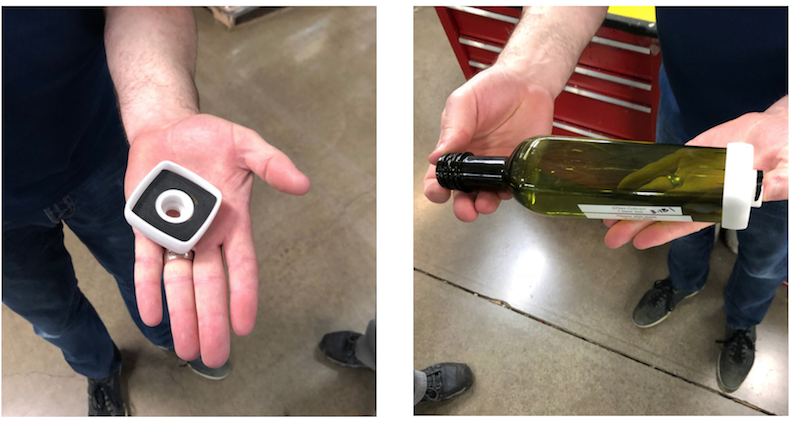 From beer to salad dressing, if it comes to you in a glass, plastic, or metal container you could be holding a tiny work of art brought to life by a custom screen printer. Founded more than 25 years ago, Tri-S prints on bottles and containers of all shapes and sizes. The magic happens in an impressive facility always smelling of freshly painted walls nestled in an expansive business complex in Tualatin, Oregon. With a team of 25 employees, Tri-S can print 15,000 to 20,000 bottles in a single day. Their clients are mostly West-Coast based companies, though their reach is nationwide. You may recognize some of their more well-known clients above. Working with a German company, they had a custom screen printing machine built, holding up to 15 bottles at a time. As with most businesses, Tri-S was looking for a way to bring some of their costs down while maintaining quality, and increase production speed. One area they wanted to change: the manufacturing of the base cups that hold the bottles in place while being screen printed and cured. Each bottle has a different diameter and radius, so it’s important that the base cup is a perfect fit to its bottle mate. A steel base cup predecessor. In the past, they had a full set of tooling – 16 base cups and nose cones – manufactured by the same German makers of their printing machines. Since each bottle differs in shape and size, it is rare that a bottle will fit in a set already on site. Moreover, even bottles of the same style can differ in size due to the nature of glass and the molding process used to create bottles. To accommodate new bottle shapes and sizes, they would manufacture a steel set for every style of bottle to the tune of ~$8,000, some costing upwards of ~$20,000. It would normally take 8 weeks to receive a set, which, in manufacturing, is a rather long turnaround time. An interior view of das maschine where the bottles rest. An alternative was to look a little close to home, and they went with a machine shop just down the street. They came up with a similar design, though it was made of steel and polyurethane. While the cost did come down some, the turnaround time would often be about the same. In addition to the delay in getting new sets produced, there was the issue of the steel’s fragility; if a cup were to be dropped, it could alter the shape of the base and bottles would no longer fit. The new plastic base cup. We recently had the opportunity to pick John Chapman’s brain at the Tri-S facility. The company’s current President and CEO, John knows the ins and outs of the business. He saw the challenges with their current base cup manufacturers and saw the opportunity of 3D printing. He did a Google search and came across Northwest Rapid Manufacturing. (And we’re so glad he did!) We’re happy to now be their go-to printer. Every piece of tooling is now printed by us, including the grippers that grab the bottles and set them into the base cup. A set of 3D-printed grippers. The solution for their base cup troubles came in the form of a glass-filled nylon with a rubber liner. In John’s words, they “appear to be holding up well.” The major source of wear and tear comes from the UV curing process and the bottles being inserted into the cup. Aside from some color changes, the 3D-printed parts are paying for themselves. On average, a set costs just $35 with a turnaround time of 7 to 10 business days. Parts are now easily and quickly made for new bottle sizes and shapes. The only tools that we currently can’t replace are those found in another machine used for spray coating. During this process, they’re able to turn brown bottles pink, for example, with the assistance of metal tools. The spray coating needs to be cured in an oven, and, unfortunately, the 400-degree oven would melt the 3D-printed parts. Those parts are still made of steel. One design variation of the base cap. It makes our little engineering hearts happy to know our 3D printing helps businesses run more smoothly. 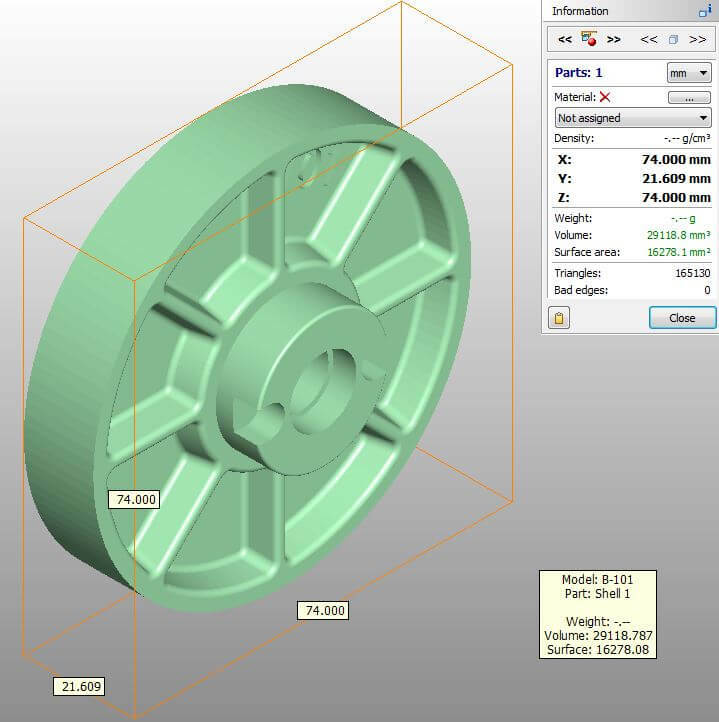 Have you thought about a process in your business where 3D printing can expedite or lower costs? Let’s talk!